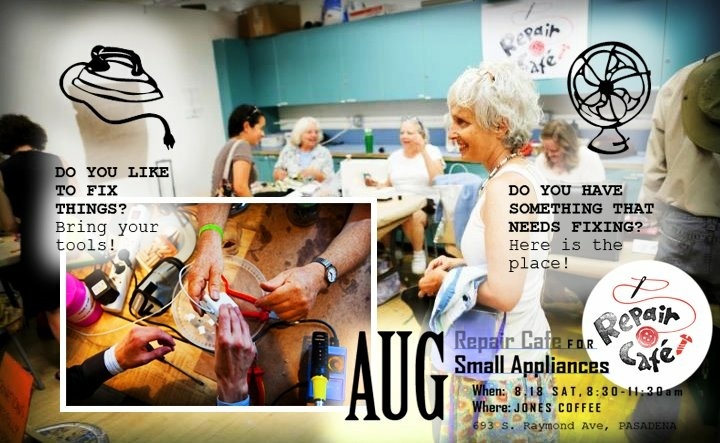 The Repair Cafe seeks to rescue your beloved items from the dump!! They'll will have Tinkers and tailors for repairs of appliances, electronics, Mac software, clothing, an jewelry. And this weekend they'll feature a special new addition: Repairing your bad haircut! They'll also have a Really Really Free Market: Bring what you no longer need in good condition and take what you can use... It's all free! There will be a Zero Waste vegan potluck in the Batchelder-tiled patio and a garden tour of the permaculture Throop Garden (with sunflowers as high as the elephant’s eye)! A Time Banker will also be present to answer questions you may have on the Arroyo Time Bank.